When 2,500 London cyclists took to Blackfriars Bridge two weeks ago it must have come as quite a shock to Transport for London. From the start they haven't been able to articulate that they truly understood why so many people were upset with their plans. Indeed, in a recent presentation to the London Assembly representatives from TfL said they thought that Blackfriars was not atypical of other major London junctions "which work well for cyclists". Clearly, these same representatives haven't tried to cycle round the Elephant and Castle with a cargo bike full of kids recently, or tried to cross Parliament Square without having to dress up like Mark Cavendish and match his cadence; to be clear, none of these junctions "work well for cyclists." 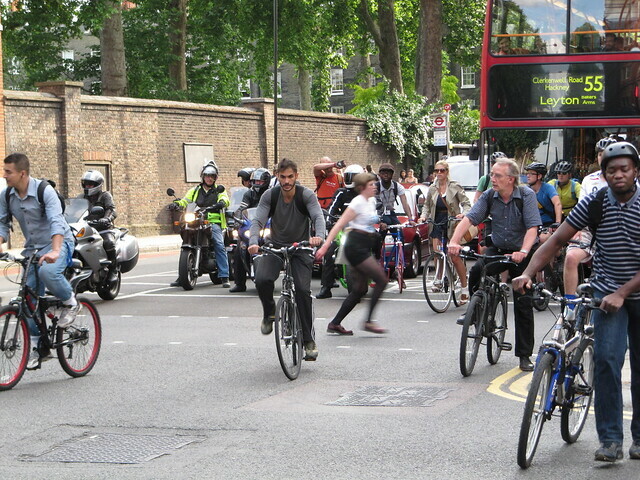 Why did 2500 London cyclists take to the streets on Blackfriars Bridge? In a recent Mayoral question and answer session, TfL revealed their 10 most dangerous junctions for cyclists, where the most collisions and cyclist's fatalities have taken place. Right there at the top of the list is the Elephant and Castle - possibly London's most notorious gyratory and certainly one of it's most deeply unpleasant. An "ambitious" scheme to replace the double roundabout with a pedestrian peninsula, creating a new large public square, safer and more direct crossing points for people on foot, escalator access to the Underground station and space for play and more trees was rejected by Transport for London because it would "slow down traffic too much". And how is this measured? To be clear, this means pedestrians aren't counted. Cyclists aren't counted. Even people on buses don't count. If the primary measure for managing our streets is the pursuit of moving as many cars, vans and trucks through the space as possible it is no surprise that our streets are designed with this in mind. Everything else is an after thought; it doesn't matter if your Cycle Superhighway disappears beneath parked cars, or if your safe route to school evaporates in a melee of speeding traffic at the most dangerous junction; you just don't count. And yet London desperately needs it's cyclists. Figures which are now a few years old show there are half a million journeys by bike every day in our city. If we all gave up tomorrow and went each by car instead we'd create a traffic jam 2240km long. The potential environmental, social and economic benefits of creating conditions for many more people to feel comfortable cycling can not be underestimated. Dare I say it, it might even make driving in the city better for those who actually really need to. The latest plans for the 'new' Elephant and Castle; does this look like a 21st century city space to you? But Transport for London are doing all they can to create conditions which discourage going by foot and going by car. Now that the Elephant and Castle pedestrian peninsula has seemingly been canned, the latest proposal is a multi-lane roundabout where people on bikes will have to cross eight lanes of fast moving traffic to get from one side to the other. Hardly the sign of a 21st Century Cycling city. And the conditions currently being created at Blackfriars Bridge are, by now, well known - despite cyclists making up the majority of traffic on the bridge at peak times. As citizens and as cyclists we have every right to feel very concerned. These kind of issues can only be resolved if people who give a damn keep talking to each other and keep plugging away at the injustice of the entire situation. So, on Saturday 12th November, Cyclists in the City blog and I invite you to join us for a gentle ride around London's 10 most dangerous junctions for cyclists. Along the way we'll meet local people campaigning to help improve their local area, or have the junctions removed. We'll hear about some of the sad deaths that have passed, and hopefully we will feel resolved to help improve the situation. If you ride through these spaces we'll be glad to hear your experiences. It's not a protest, though I'm sure there will be anger and many other emotions on the day. You'll meet other like minded cyclists and residents and see first hand what needs to be done. The ride will be gently paced and no one will look down on you if you prefer to get off and push some of the more hairy sections of the route. It's not an especially long ride, and we'll be stopping for coffee along the way. You participate entirely at your own risk, though of course the need for me to write that says in itself how entirely messed up our streets have become. As we go around each junction we'll mark them out of 10 for subjective safety, air quality, noise level, quality of cycling facilities etc. I'll compile these in to a report and send them to our friends in the Palestra building. Maybe, if we keep on plugging away at the issue, they'll start to listen. I'm going to invite the bright and good of the top brass at TfL, as well as our own cycling Mayor, Boris Johnson, to join us for the ride and see for themselves how much further their own visions for a "world class cycling city" must go. Do you think they'll join us? Will you? Umm... Mark, you are meeting in KENNINGTON, NOT Kensington! @hellibird Well spotted! I've fixed that. Indeed, to be clear we are meeting in Kennington, as in south of the river. Silly me! I'll be there. Today, TfL killed yet another cyclist, at the Bow Interchange, on the Cycling Superhighway. The BBC report says "The Metropolitan Police said a man had been arrested on suspicion of dangerous driving in connection with the crash." But in response, TfL's spokesman talks about "awareness campaigns about the dangers of undertaking lorries, over the past year." This is news management at its most cynical, and these utter bastards need to be brought down. Unfortunately I can't join, since I'll be cycling around the safe streets of Copenhagen that weekend. All the best of luck ! Great idea, I will make every effort to be there. Any chance the route of the 10 junctions can be drawn on a map? @Schack Have a wonderful time in Wonderful Wonderful Copenhagen - I hope the weather is bright and clear for you! @Mitsky Good idea. I will endeavour to have a copy of the route up before we set off. Great idea, I'm planning on being there. "Transport for London are doing all they can to create conditions which discourage going by foot and going by car."? Should "car" be replaced by "bicycle"? Indeed, Chris, I did mean by foot and by bycle. Hope to see you on the 12th, when hopefully I will be making an awful lot more sense. In my earlier comment, I quoted the BBC [http://www.bbc.co.uk/news/uk-england-london-15440182] quoting Tfl : "...awareness campaigns about the dangers of undertaking lorries..."
The Evening Standard version just posted [http://www.thisislondon.co.uk/standard/article-24002124-man-knocked-off-his-bike-is-first-to-die-on-superhighway.do] now talks of "initiatives like new roadside safety mirrors and awareness campaigns about the dangers of overtaking lorries." It's 1984, subtle rewriting of the news... words are cheaper than paint, and paint is cheaper than infrastructure. I vote for a mass flash campaign to disrupt every single Boris appearance from now till the election, with the banner "Stop the TfL Murder." Awesome idea! Although I no longer cycle in London, (I live in Colchester), I will be there! I'll try to get down to this, I have rode around these bits hundreds of times and they still scare the pants off me so would like to come and show my support. There have to be strong grounds for a legal challenge to TfL's emphasis on motor vehicles (those with a licence to use the road) over cyclists and pedestrians (those with a right to use the road). Imagine what 2,500 bikes would look like if they each had a bamboo frame to imitate the space taken by a car! Thanks StBill - indeed, the 2500 who came to Blackfriars are just the tip of the iceberg. London has approximately 500,000 daily cycle journeys a day - if all those trips were done in an average sized UK family car those vehicles would create a tailback 2240km long! St Bill, I have just checked it out, and will be joining you in the very near future! Hi Mark, this is a good idea and I hope to come. Ref the point at the start of your blog about TfL not getting it: I attended a presentation last week by Alexandra Goodship, TfL's cycling delivery manager. It's easy to bash TfL, but I wanted to know what we as outsiders could do to help her as an insider get more traction with TfL petrolheads. Her answer? Encourage other people to take up cycling, which will increase modal share stats, and improve the business case internally. It's a really disappointing response. For one, it underlines this point about TfL failing to understand that current road conditions are what deters many people from cycling, hence the agitation about poor design. And anyway, there's already a pretty decent business case for investing (properly) in cycling.